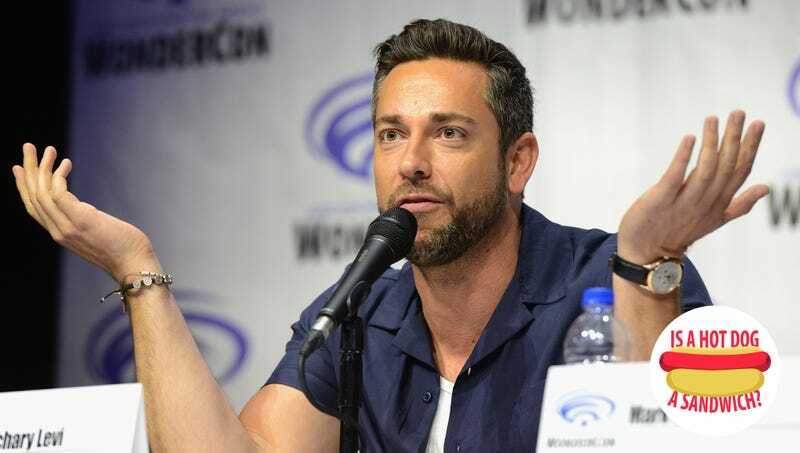 Zachary Levi just took a giant leap into superhero stardom, as the new DC movie Shazam! opened on April 5. It’s a fun romp wherein Levi personifies a young boy who now inhabits the body of a superhero. (First step: Buy some beer.) As he is a comics fan from way back, the role is a dream come true for Levi, who traveled through TV (Chuck, Heroes Reborn), animated Disney movies (Tangled), the MCU (the Thor movies), and prestigious streaming series (Alias Grace, The Marvelous Mrs. Maisel) to get here. As stacked as his filmography is, and as much as Levi appears to enjoy his newfound superhero film star status, he can’t fully enter the pop cultural lexicon without first answering the most pressing question of our time. As it turned out, The Takeout wasn’t the first to try. Zachary Levi: We’re getting to the hard-hitting stuff here. ZL: I’ve been asked this before. ZL: At first I was like, that’s an absurd question. Then, because I’d never heard the question before—theoretically, it’s meat that’s in bread. Is that what constitutes a sandwich? Exactly. But then I wondered how much you need to have two separate pieces, because the bun is technically one piece? So it’s closer to a taco, I think. In its phylum, or genus, I think we would classify it more as the American taco. TO: So not a sandwich. An American taco? ZL: A cross between a sandwich and a taco. A tac-wich. TO: A sand-co. Boy, we both went opposite ways there. Shazam! is currently playing in movie theaters across the country. If you want more Zachary Levi on your small screen—and why wouldn’t you—check out season two of The Marvelous Mrs. Maisel on Amazon Prime, and the mini-series Alias Grace on Netflix.